INCOMING! 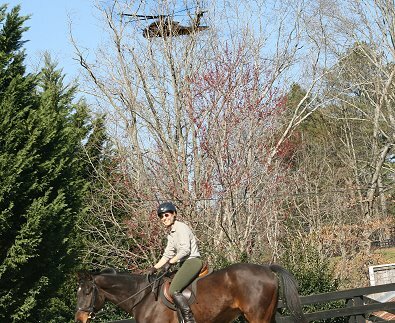 Notice the helicopter heading right over our Thoroughbred Horse For Sale - Bounced! 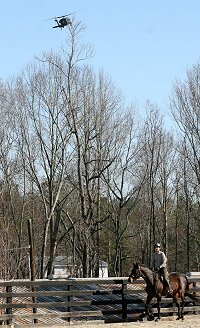 Read the story on our March 12, 2008 Training Notes page. 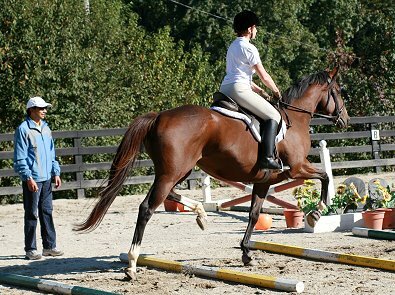 Heather's Best and Elizabeth jump the coop at Oxer Farm. 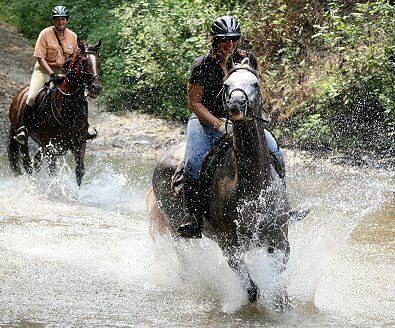 Elizabeth checks the girth on Aly's Charmer at the beginning of the trail ride. Paula singing, "We are the Champions . 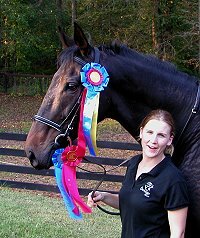 . ." to Joe Bear after winning her dressage division at Oxer Farm. Irish Morning Mist and Gertjan and Barry in the background on yet another bay. 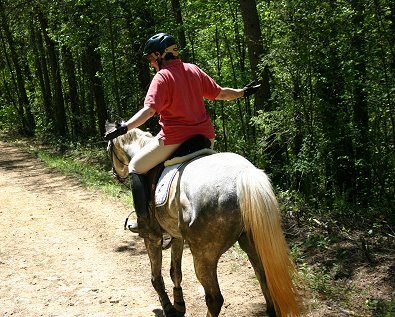 Grayboo and Elizabeth enjoy a trail ride. 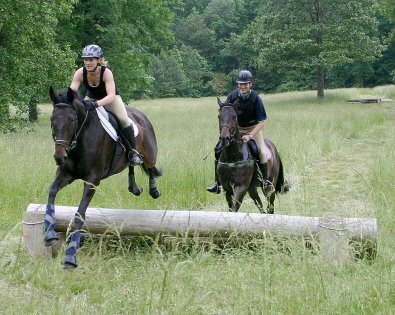 Our training notes often show schooling at the farm but may also include cross country schoolings and trail rides away from the farm. 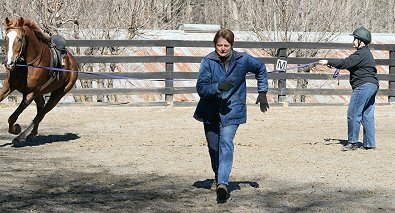 Go back through our notes to see how we train our off-the-track Thoroughbreds and prepare them for new careers as sport horses. 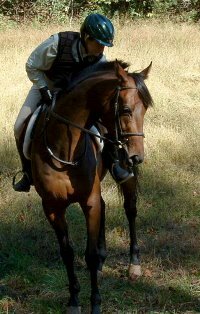 TRAINING NOTES FROM ELIZABETH Riding Your OTTB for the First Time Lowering Your Horse's Head HELP!! 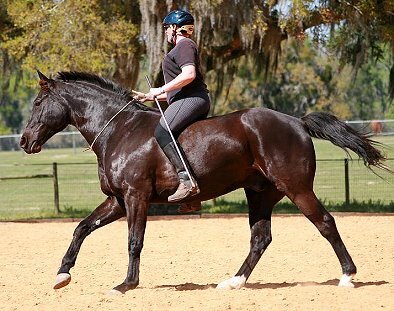 - My Horse is Rearing by Kara Hoefer Ground Training with Phil's Courage by Kara Hoefer De-spooking with Helicopters Hunter Pace - First Time Away Off-the-Farm	Learning to Canter is All About Balance Trailer Choices from Elizabeth Starting to Train Your Off-the-Track Thoroughbred Worming Thoroughbreds - Putting Weight on OTTB Thoroughbreds Training Thoroughbreds to Go Through Water Training Thoroughbreds to Step Over Poles Horse Buyers Checklist - Compare our horses to other horses for sale Natural Horsemanship - transistion from race horse to sport horse OTTBS Trail Riding at Jake Mountain in North Georgia Chiropractic Care - Does my horse need chiropractic care? Chiropratic Daily Stretches - Handout Getting Your Horse to Bend Trailer Rides and Cross Country Schooling Retraining OTTBs - Maryland Horseworld Expo Handouts Dressage & Jumping Clinic with Imtiaz Anees Jumping Clinic with Imtiaz Anees OTTB's - Choose Your Horse Carefully Learning to Plan Ahead and Be Precise with Jumping Oxer Farm Schooling Show Combined Schooling at Oxer Farm Bay-bies Go Trail Riding Hunter Pace - Ride a TB for a Good Cause "Friends" Hit the Road to Competition Gymnastics Training "Bay Day" Cross-country schooling Gymnastic Training at Bits & Bytes Farm Poplar Place Farm Horse Trails / B&B Picnic Shamrock Hounds Poker Ride Cross-Country Gallop Training Thoroughbreds Celebrate Independence Day Weekend Sunday's Training Session - X-Country! 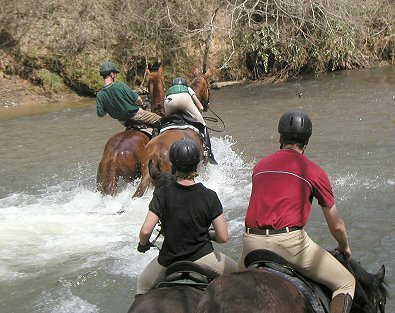 Sunday's Training Session - Water Crossings! 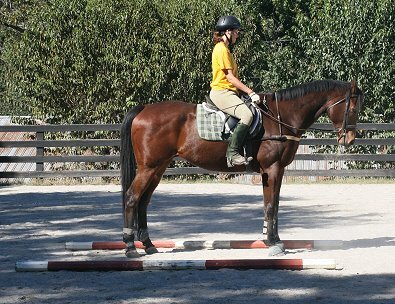 We now have another site just for OTTB Training Notes! Go to our new site: www.trainingottbs.com. 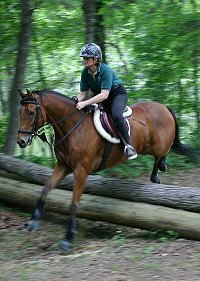 Our newest Thoroughbred Training Note from Elizabeth is all about Riding your OTTB for the first time. 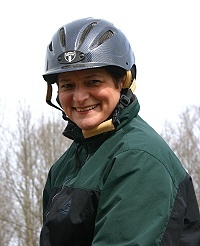 Elizabeth helps new horse owners learn to train their horses . 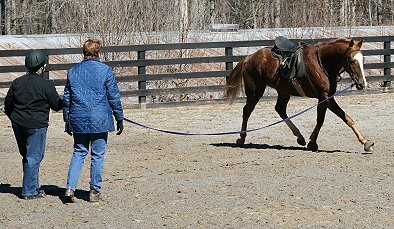 . . and then she steps aside to let them learn themselves how to train their horse! 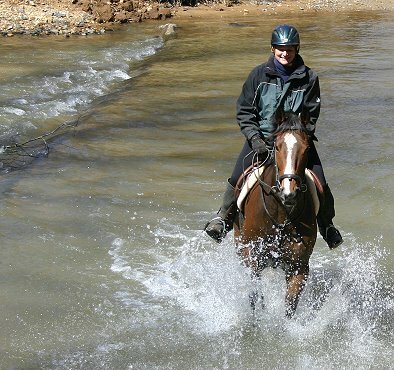 Elizabeth Wood and Sing D Song on a trail ride in North Georgia. Robin L. Cannizzaro D.V.M., C.V.A. 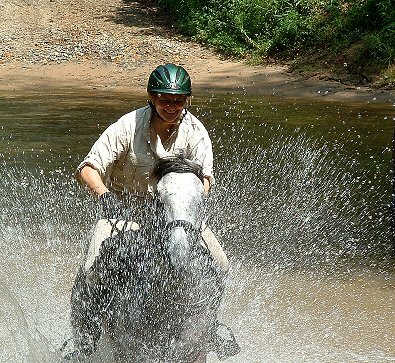 of Wholistic Veterinary Care believes in Natural Horsemanship. 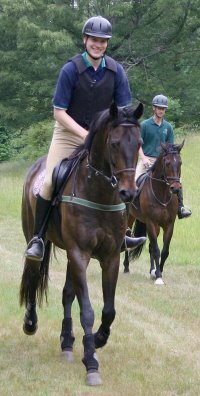 She purchased Vicky Vicky Vicky as a Prospect Horse. 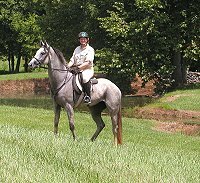 Grayboo shows that even a horse right off-the-track has what it takes to be an event horse. -- photo by Marie vanRoekel. 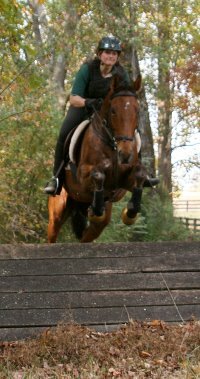 Joe Bear and Paula racing Irish and Gertjan over the cross-country course. Notice Barry whipping Marie to hurry her across. © 2005 Copyright Bits & Bytes Farm /Egeland Wood & Zuber, Inc.